Personally, I’m happy for any new mother, and I thought that Duchess Kate looked classy and appropriate, as always. Of course I realized that no one really walks around in high heels on such an occasion: the heels and the cleverly placed baby blanket were excellent props that helped pull the whole picture together. As a public figure, it’s her job to look nice, so I don’t begrudge her rising to the occasion. With my own due date fast approaching, I determined to see just how fabulous one could look post-partum without a team of professional beautifiers weighing in. Most optimistically, I packed in my hospital bag a pretty dress (on faith—I had picked it up at the community clothing exchange while pregnant and had never actually tried it on) and moderate heels, which I rarely wear even under the most normal of circumstances. My goal was two-fold: to prove that regular, everyday people can look nice enough, with a little effort, and to demonstrate that the posed prettiness we see in other people’s lives usually relies on some helpful props, which anyone can employ. In short, I wanted to make the ideal accessible. As it turned out, I proved a larger point, which is that we should strive to do the best we can with the resources we have, and that absolute perfection isn’t always worth striving for. Preparations for my fixed photo were realistic. 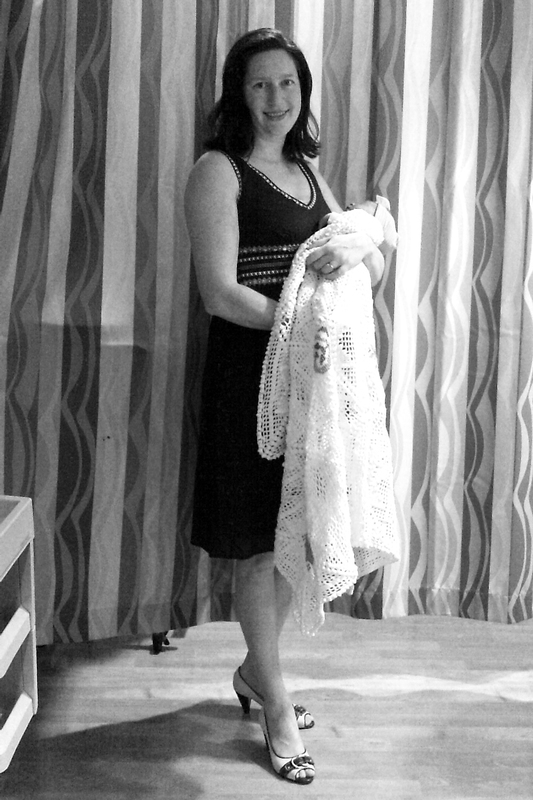 The optimistic dress wouldn’t completely zip up after all, but I shoved my feet into the heels just the same, draped the baby blanket over my bulging belly, and smiled for the camera. In all honesty, it wasn’t my best effort. I could have spent more time on makeup and hair, and I might have even stepped outside for a prettier background, if my overarching priority was to snap a perfect photo rather than, say, attend to my baby or visit with well-wishers. But it was about the best effort I felt reasonably motivated to make, and that’s what I was going for. I found the whole exercise amusing, and I think it illustrated a good moral about comparisons and expectations in general. There are plenty of people out there—speakers, bloggers, authors, etc.—whose job it is to look good, and who have the time, energy, and personal or professional support to present the ideal schooling schedule, the perfect field trip, the most nutritious lunches, the complicated and educational craft, and so on. While we can certainly be inspired and motivated by others’ excellence in various capacities, we shouldn’t believe that we can or even should effortlessly do it all. Let’s scale back our expectations for ourselves from the unattainable great to the reasonable, acceptable, and achievable good—and have fun doing it! Photo Credit: All photos by Rose Focht.